Free standing cast iron baths were introduced during the 1880's. Vitreous enamelled cast iron baths were in use before this time but were usually enclosed within wooden surrounds. The freestanding designs came about through a concern with hygiene and the ability to clean all around the bath. They were made up to around the middle of the 20th Century when they were gradually replaced by rectangular panel baths designed to fit against walls and into corners. The manufacturing process involved the bath body being cast at a foundry. The enamel coating the inside was then formed by firing an applied glaze solution in a furnace. The feet were cast separately and fixed to the body of the bath with bolts. 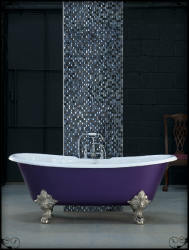 Todays cast iron baths are manufactured in much the same way and stay true to the original designs. The authentic styles still convey a sense of luxury and opulence that will form the centre piece of any traditional bathroom. Our line of superior quality Arroll Cast Iron Baths are perfect for soaking away all of the stresses and worries of the day. Light some candles, put on some relaxing music and steep away in one of our sumptuous Cast Iron Baths. Whether your building is a traditional period design, or a more contemporary environment, we will have the perfect Cast Iron Bath for you. All of our Cast Iron Baths are shipped out in a very robust wooden crate to ensure that they reach you in perfect condition.